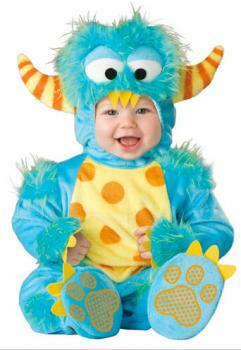 Finding the perfect get up for your baby for Halloween is easy if you know where to look. Whether you want something simple or something unique, there is a great place to shop out there for you. You've scoured the racks of local costume shops but you still haven't found that perfect costume. Whether you want something simple, or something that makes your infant stand out - these places have picture-perfect costumes for Halloween. Baby Squirrel Costume - Running in sizes from three months to 12 months, this one-piece ensemble comes with a hooded cape and sleep sack style bodice. The outfit is made from lined fleece and faux fur, so it's a great option for a cold night. The outfit retails for around $60. Baby Spider Costume - Create a cute buzz with friends and family when you dress up baby in this spider costume. It comes intwo pieces - headpiece and body - in sizes 4 to 6 months. The costume is available for just under $50. Pottery Barn also sells jack-o-lantern diaper covers for an easy option for a baby on-the-move. Little Monster - While this generic monster might not be scary, he sure is fun. The one-piece, fuzzy suit features a zippered front, hood, and it comes in sizes six months to 24 months. Reviewers note that it is especially cozy. It retails for about $50. Supergirl - Available in sizes 0 to 18 months, this cute ensemble features blue tights, a blue long-sleeved onesie with the Superman logo (complete with red cape), and a red and blue tutu. It also comes with a matching headband. Supergirl has never been so cute, and for approximately $25, you can't go wrong. The costume had one reviewer who noted that it looks as pictured and was very adorable, while another was pleased the costume came in pieces. Little Lamb - Sold in sizes 0-24 months, this cute costume is sure to delight your girly girl. Featuring a one-piece dress with fluffy sleeves, a pink gingham bodice and a full tulle skirt. The outfit comes with a fluffy hood, tights and booties. Retailing for about $30, this costume will make every little girl feel special. Baby Cappucino - It's so simple and yet everyone will love Baby Cappucino. The outfit features a onesie snap suit that is fashioned to look like a cup of coffee, and it comes with a ruffled collar and a hat that is supposed to look like whipped cream. While the hat isn't likely to stay on for a long time, it is cute for the photo op. Coming in sizes 6-18 months, the outfit retails for about $24. If you have a Disney princess in the making, the Disney store is the place to hit for Halloween costumes. Running in a variety of sizes and featuring all types of Disney characters, from princesses to an Aristocat, the Disney store is an easy choice if you have your eyes on a recognizable character. Baby Tinkerbell - An adorably soft velour, one-piece bodice with attached tulle and organza make up this cute Tinker Belle costume for your littlest fairy. For about $30, the costume comes with attachable wings on the back, but the headpiece and shoes are sold separately. Reviewers note that sizes run a bit small, but that the outfit is very cute and of good quality. It comes in sizes six to 24 months. When you shop for a Halloween costume for your baby, keep in mind that what you think looks cute, he might hate to wear. Look for outfits that are going to fit with his personality. In other words, if your baby pulls off hats, make sure the focal point of the costume isn't a hat. Remember too that babies are messy, and your costume could get ruined with drool, spit up, or by diaper accidents. Consequently, look for something reasonable that won't break the bank that your child can stand to wear.